A game that blends elements of the role-playing and puzzle games genres. As in a more traditional RPG, players move around on an overworld map; collect items, spells, equipment, and gold; gain levels to increase their character's stats; and progress in a story. The battles, however, take place in a competitive variant of the puzzle game Bejeweled. Characters match certain combinations of jewels in order to attack or use special abilities or spells. 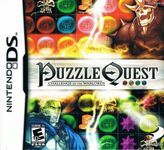 Puzzle Quest: Challenge of the Warlords was published simultaneously for the Nintendo DS and PlayStation Portable. A surprise hit, both critically and commercially, it was later ported to several other platforms. It was followed by a sequel: Puzzle Quest: Galactrix.